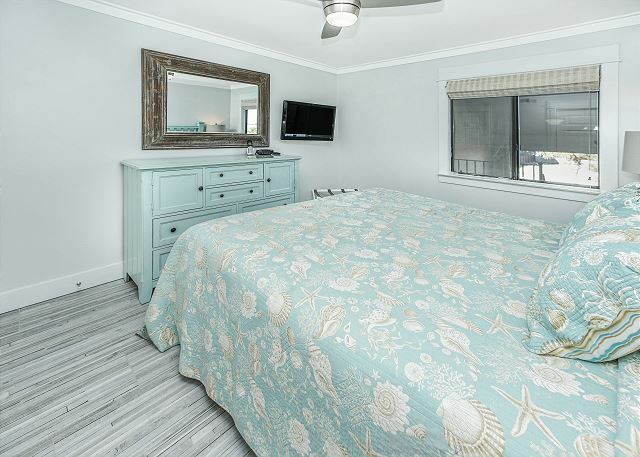 Experience a peaceful beach vacation at beautiful Serenity at Seamist Unit 9! Serenity at Seamist sleeps up to six with a King size bed, Queen sleeper sofa and two Twin bunk beds. 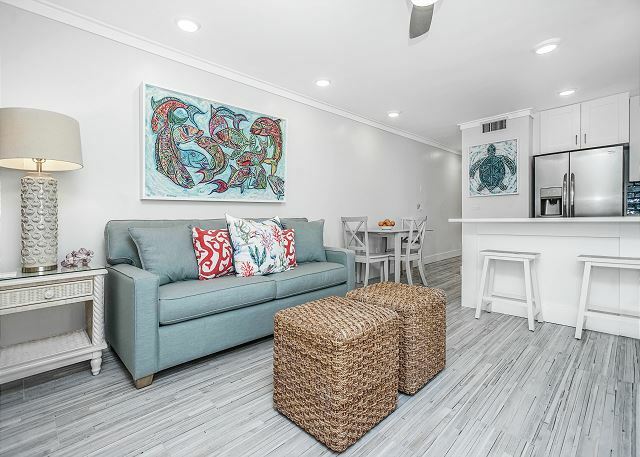 Serenity at Seamist has been completely remodeled and decorated with a modern, elegant beach décor. 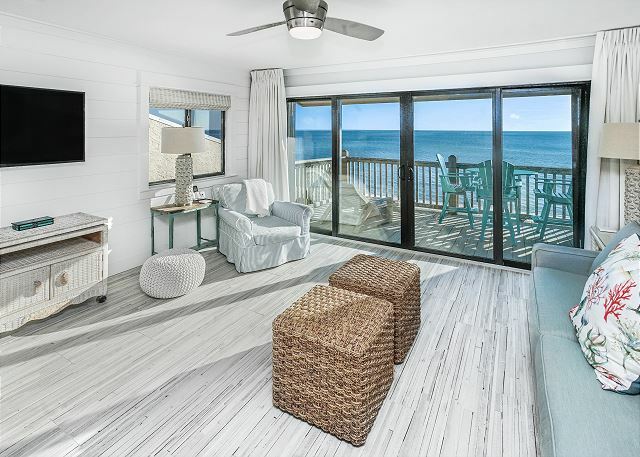 You will be greeted by breathtaking beach views of Panama City Beach all the way to Destin. Inside, you will find all the luxury comforts one needs for their ultimate beach vacation. Spacious living area with boarded nickel slot wall and a 50” mounted flat screen TV. 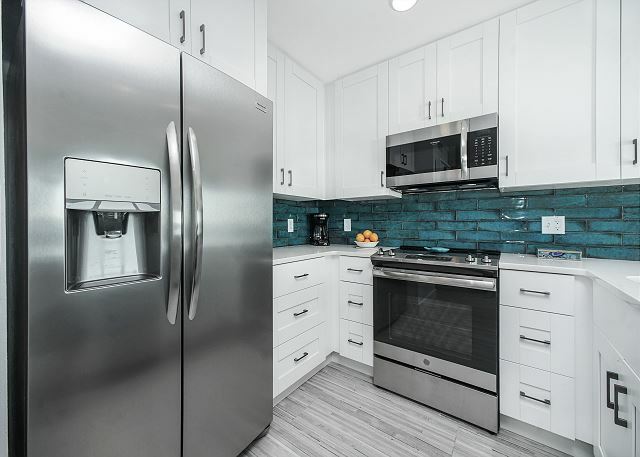 The upgraded and expanded kitchen features quartz counters, stainless appliances, and full-size refrigerator with crushed ice dispenser. 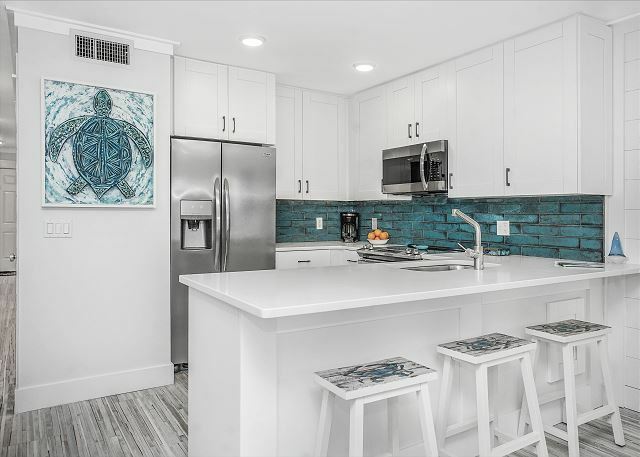 You won’t miss the incredible ocean view from the counter height breakfast bar. The private balcony is furnished with high top swivel chairs overlooking the brilliant, blue-green waters of the Gulf of Mexico. Perfect place to watch for the dolphins. Experience fresh air, warm breezes, long walks on the beach, and the calming sounds of the waves. There is nothing quite like burying your feet in the sand at the beach. It’s soothing to the soul. When you are not dining at local restaurants along the beach, grill up your favorite foods on the two community barbecue grills. 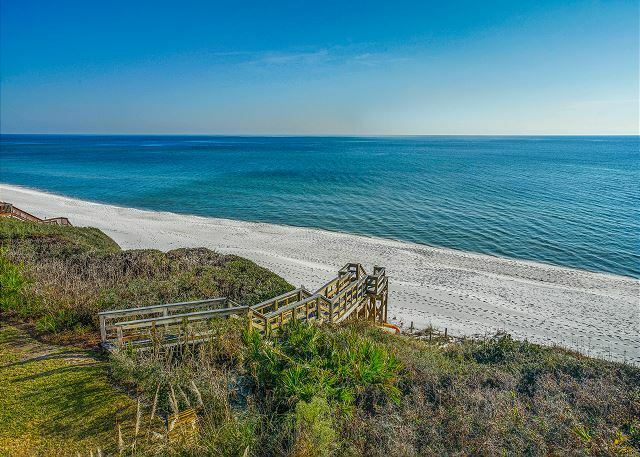 During your stay you should explore Scenic 30A. Visit Rosemary Beach, Alys Beach, Seaside and Grayton Beach. Serenity at Seamist Unit 9 is one of twelve units in a 3-story building. Not a high rise around for 4 miles! 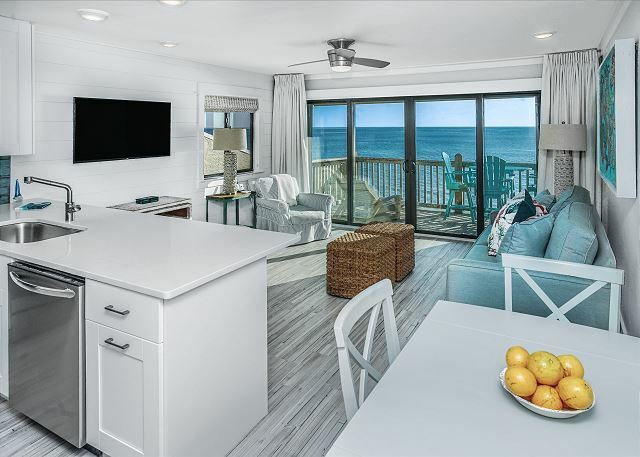 Once you experience beach living at Serenity at Seamist Unit 9, you'll want to return every year. Give us a call to reserve your dates today! 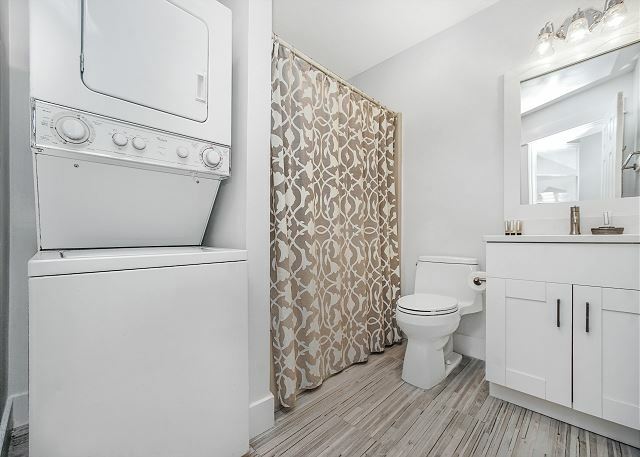 - Updated bath with stacked washer and dryer. SUGGESTED ITEMS TO BRING: Beach towels, beach chairs, tanning lotion, camera, radio/ipod, paper towels, toilet paper, trash bags, dishwasher detergent, laundry soap, bath soap, shampoo, bicycles, rafts, coffee filters, antiseptic, flashlights, umbrellas, and fishing gear. Most of these items can also be purchased locally, and bicycles can be rented locally as well. Loved the location...convenient to Rosemary, Alys, and Seaside. 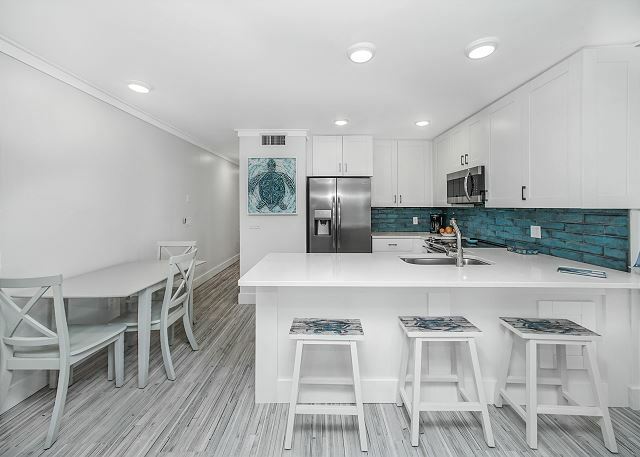 The condo was beautifully renovated with a beautiful balcony view of the gulf. Definitely plan to stay again...and again. My husband and I enjoyed our stay at the seamist. The location was great! The condo was nice. The only suggestion I would make is to upgrade the condo a little. The condo has carpet and makes it seem dark and depressing. Tracking sand inside carpet is not fun. That’s the only reason I give this property an overall 4 out of 5 stars. Everything else about the condo was nice. Thank you for your review. Y'all will want to stay tuned on this one because the updates are coming! This unit was recently sold and the new owners want to do some remodeling - it is great now but it is going to be awesome! We have a few reservations left before the work begins so get in now and then come back later for the full experience! No matter what - you cannot beat the views from this 3rd floor gem! 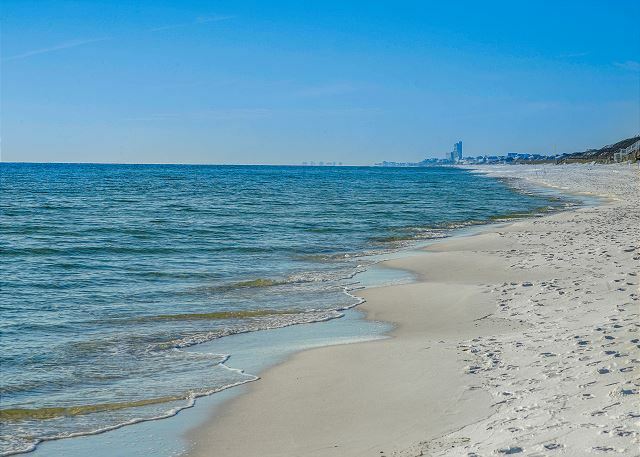 Located right on the Gulf of Mexico it is a sight to behold - pearly white sand, turquoise waters, gently rolling waves and of course the dolphins! There is Serenity at Seamist - come find out for yourself! Call Benchmark today! My husband and I stayed at Serenity at Seamist for a quick getaway in late July 2018. The location was perfect and the beach was amazing. It wasn’t overly crowded at all. The condo had everything we needed and was clean and in great shape. The view from the balcony is gorgeous. The management company was so easy to work with and the check in/out process was a breeze. I’d recommend this unit to anyone. We loved our stay at The Seamist. The unit greatly exceeded our expectation. This unit is perfect for a couple or small family. It isnt large, but has everything you need. 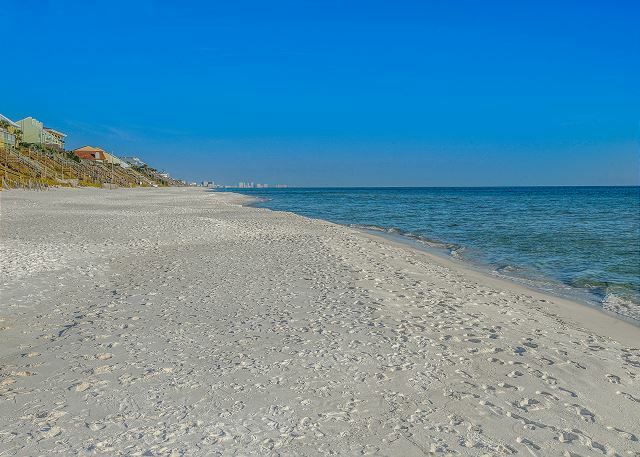 The unit has awesome views of the gulf, is located right on the beach, and is close to neighboring beaches. The beach is not crowded, and is perfectly beautiful. My husband and I prefer to visit small, casual beach bars and restaurants, which are non-existent on this stretch of 30A. There is plenty of shopping and high quality ($$$$) restaurants within a short distance. Traffic at neighboring beaches is awful, but easy to avoid getting to this unit. Our unit was ready early; and the management company called to let us know -s allowed us to check in at 10am, instead of 4pm. The unit was clean, had plenty of essentials (dish soap, towels, wi-if, Blu-ray, etc). We really felt like we were renting an economy unit, and were generally very impressed with the condition of the unit. The listed pictures dont quite do it justice. Thank you so much for your review! So glad you enjoyed your stay at Serenity at Seamist - what else can we say that you didn't already say so eloquently?? This unit is a gem! 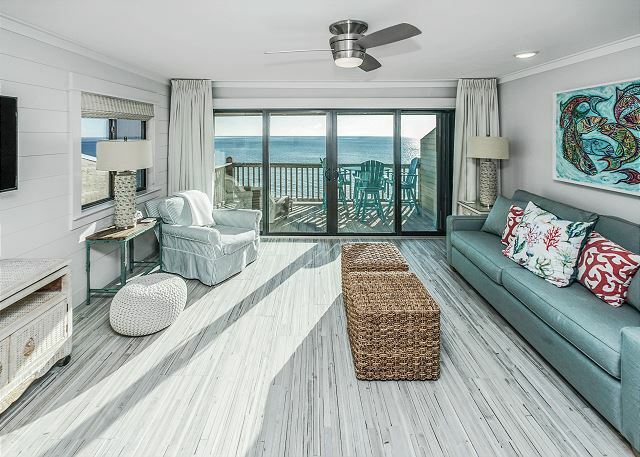 It doesn't get any better than sitting out on your balcony watching the dolphins play while you sip your morning coffee or watch the sunset light up the sky while you are sipping your favorite evening cocktail! If you have been waiting to find the perfect place to spend your next beach vacation look no further! Call Benchmark today and we can get you set up! It was quiet and clean, and an easy walk to water.We had a great time and felt very safe our entire stay. Will return. Loved the area as well. Thank you for submitting your review. We appreciate all comments and suggestions! What's not to love about Serenity at Seamist? 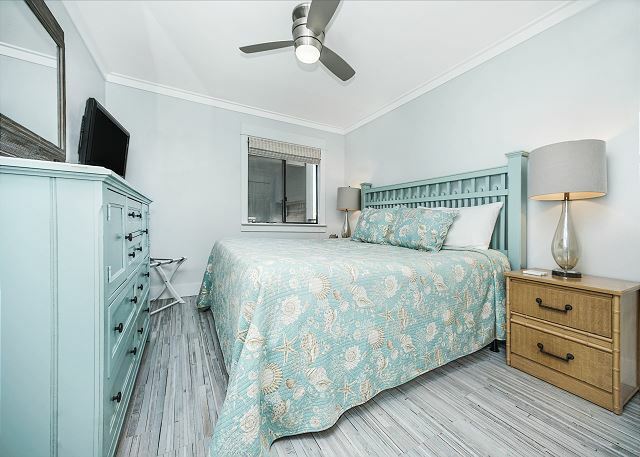 This is a wonderful condo unit with amazing views of the Gulf and it is conveniently located in very close proximity to many of the areas best boutiques and fine dining restaurants! Ready for relaxation and quiet time? You will find it here - sit on your balcony with your cup of joe, sit back, relax and watch the waves come crashing in! Call Benchmark today to find your Serenity at Seamist! I'm tempted to give a bad review so that we can keep Serenity at Seamist all to ourselves! But, that would be selfish. This is a comfortable condo, well furnished, and with a great view from the deck. Quiet too. Short walk to the beach and RentGearHere had our chairs, table, and umbrella set up by 9am every morning. Clean, convenient, private. We'll be back next year! We welcome you back anytime! Thank you for taking the time to submit your review. So glad you feel exactly the way we do about Serenity at Seamist - very peaceful with an amazing view! Need to get away, unplug and relax - then this is the place for you! Come get comfortable and enjoy a stay with us! Summer dates are almost gone so call us today - don't miss out on your journey to Serenity! The trip was perfect. The condo was very clean and we had a million dollar view. Everything was awesome. We are already talking about our trip back next year. Thank you so much for submitting your review! You are right about the view! It is truly an amazing site - and to be able to watch the waves rolling in and the dolphins playing in the surf - well these are the things memories are made of! Come have your unforgettable experience with us soon! You will feel serene at Serenity at Seamist! We are booking now!! We got exactly what we expected, which is good. Ideal location, perfect beach view, and the condo was in good condition, but could use some updating. However, that would likely increase the price, so overall, a fair value. Check in instructions were not communicated prior to arrival which created some problems. Thank you for taking the time to submit your review - your feedback is very helpful to us. As mentioned we did have some difficulty communicating the check in instructions. We have been in the process of transitioning to new software which includes our app that has the important instructions. I do believe we are getting better but we are sorry that we caused you some difficulty! We hope that you join us again in the future! Condo very clean and fresh. Can't beat the view. Great stay. Thank you for submitting your review! So glad you enjoyed your stay! 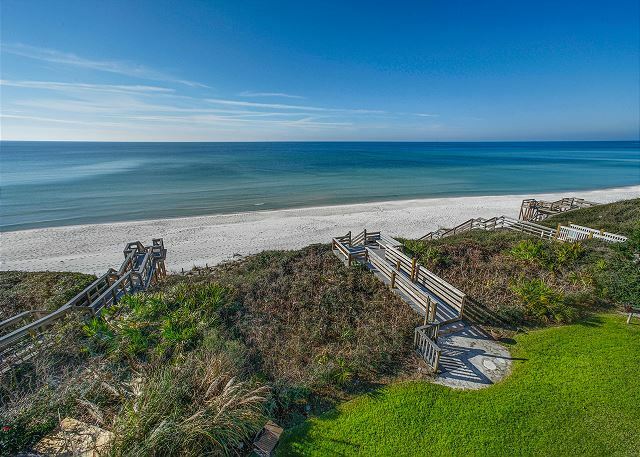 This condo is hard to beat - it's right in the heart of Seagrove and the view is most fantastic! We hope that you will join us again soon!